Will automakers go for Gorilla Glass? Corning's Gorilla Glass acoustic partition improves sound isolation in BMW's i8 plug-in hybrid. Gorilla Glass, the tough, lightweight, scratch-resistant glass made by Corning Inc. and used on the screens of billions of smartphones and tablets, is getting closer to being used in windshields and other glass apertures of production vehicles. Ford Motor Co. and other carmakers are testing Gorilla Glass and other so-called chemically toughened glass products as they search for new ways to take weight out of their vehicles to meet stringent fuel economy standards. 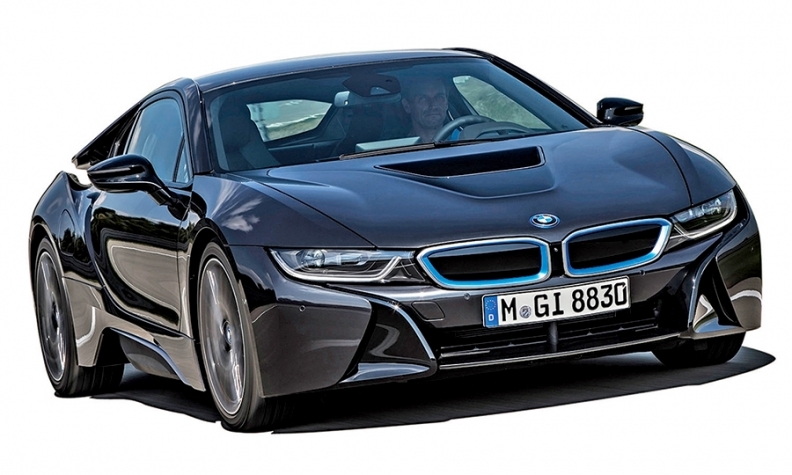 BMW already is using a Gorilla Glass panel on its sleek i8. Like many other lightweighting technologies, Gorilla Glass involves a trade-off: It costs more than the traditional glass it would partially replace. It could help with a tough problem in weight reduction. But because glass is an inexpensive commodity, carmakers have to balance the weight savings against the extra expense. Matt Zaluzec, senior technical leader for global materials and manufacturing research at Ford Motor Co., said several vehicle programs under development at Ford are studying Gorilla Glass for various uses, including windshields, side windows and rear windows. "We have a pretty good handle on what programs would need it to meet their weight targets," he said. "Several programs are looking at it." Last year, Ford showed its Fusion Lightweighting Concept vehicle with a hybrid windshield made using a conventional soda lime glass panel laminated to a Gorilla Glass panel. 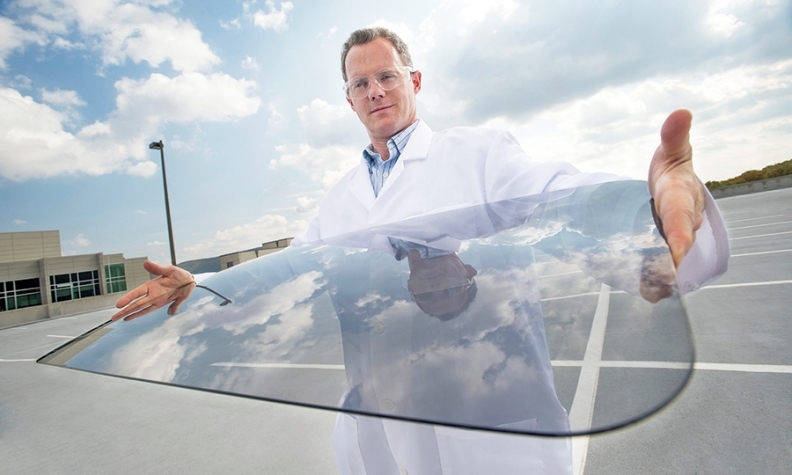 The hybrid windshield "met our safety criteria, and weight savings criteria," says Zaluzec. The fact that carmakers are looking at Gorilla Glass and other glazing technologies marks a change. "There has been little or no innovation in the glazing space in decades. Automotive cycles are just long," says Doug Harshbarger, business director of Corning's automotive glass solutions. Matteo Fini, senior manager of global component forecasts for IHS in London, says that because glass is such an important element in vehicle safety, "OEMs cannot play around with it too much. That means they're reluctant to change." But Corning sees a big opportunity for Gorilla Glass, which is made by immersing thin sheets of glass in a hot bath of molten salt at a temperature of approximately 752 F, according to Corning's website. In the molten bath, smaller sodium ions leave the glass and are replaced by larger potassium ions. This creates compression and makes the surface more damage resistant. Russ Corsi, president of Technical Autoglass Consultants in Pittsburgh, says aircraft manufacturers such as Airbus have used chemically strengthened glass extensively to save weight. "Aircraft companies will pay more because of weight savings. Automotive companies don't want to pay for glass" because they can buy windshield glass and thermally tempered side window glass so cheaply, he says. Corsi is skeptical that the weight savings will be worth the extra cost. He says a typical windshield costs $20 and weighs 20 pounds. Harshbarger estimates that Gorilla Glass will reduce weight by 25 to 30 percent, or 5 to 6 pounds. Corning says Gorilla Glass will cost $2-$4 for every pound of weight saved, putting the price premium between $10 and $24 for a windshield. Harshbarger says Corning is working with several carmakers and glass companies on applications, including windshields, sunroofs and dashboard displays. Corning is touting several Gorilla Glass properties: light weight, flexibility, strength and excellent optics for features such as head-up displays. "We've demonstrated it for every opening within a car. We see quite a lot of prominence for it as a windshield," Harshbarger says. "Everyone is lightweighting their vehicles. The only way to do that with glass is to make it thinner. If it's going to be thinner, it better be stronger." The BMW i8 has a Gorilla Glass panel behind the engine compartment. Gorilla Glass is more likely to appear first on limited-production supercars such as the BMW i8 plug-in hybrid, where there's a Gorilla Glass panel behind the engine compartment. "The purpose is to improve sound isolation between the engine compartment and the passenger compartment," Harshbarger says. But Corning hopes to move beyond low-volume niche supercars. "We are also collaborating with industry-leading auto glazers to bring Gorilla Glass to more mainstream vehicles," said David Morse, Corning's chief technology officer, at an investor gathering last year. "At nearly 6 billion square feet of glass consumed annually, it is a sizable opportunity." A typical windshield consists of a sandwich of two 2.1-millimeter glass panels laminated together with the resin. Harshbarger says: "Soda lime glass on the outside and Gorilla Glass on the inside is the configuration we are offering to automakers because the inner ply is more flexible and stronger so a higher force is required to break it." By using an outer soda lime glass panel that's 2.1-millimeters thick and fusing it together with a Gorilla Glass inner panel 0.7-millimeters thick, "you can cut down the thickness and weight by 25-30 percent and have something that's stiff enough but still provides the structural rigidity a car body needs," Harshbarger says. Ford's Zaluzec says the automaker did extensive tests of Gorilla Glass, including laminating two Gorilla Glass panels together to make a windshield. But the all-Gorilla windshield was too thin and did not provide sufficient stiffness or noise isolation. So Ford ended up with a hybrid windshield of Gorilla Glass and soda lime glass. Harshbarger acknowledges it will be several years before Gorilla Glass is as ubiquitous in automobiles as it is in smartphones and other devices: "I think we've still got a few years" of lower volume vehicles like the i8 "before you see a lot of vehicles on the streets with Gorilla Glass."